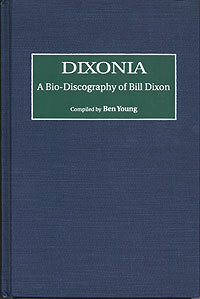 Dixonia, a bio-discography of Bill Dixon is compiled by Ben Young and was published in August 1998 by Greenwood Press, Westport, Connecticut. ISBN 0-313030275-8; http://www.greenwood.com. "Dixonia is fundamentally a book of facts. While the proper understanding of Bill Dixon's music will show that future volumes of musical analysis, biography, critical assessment, and record guides are warranted, this volume concerns itself only tangentially with these matters, but primarily with cataloguing Dixon's works, as an indispensible step for all perspectives of analysis. The purpose of this research is to identify every known episode of Bill Dixon making music, adding relevant information about these events and their relationship to the entire trajectory of his career to date." Issued recordings; an extremely small number bearing in mind (or perhaps because of!) the radical nature of his work. Unissued recordings: which dwarf the 'formal' recordings due to Dixon's perception of recording as a reference tool, irrespective or not for subsequent release. Unrecorded performances: to 'fill in the gaps' between recordings (whether issued or not). Young attempts to list "every discrete and verifiable Bill Dixon performance". Dixon's music played by others, including its use in live dance, theatre and film events. Dixon as producer, stemming from his work for the UN in 1956, his organisation of the United Nations Jazz Society from 1959 to 1962, his running of the Cellar Cafe in NYC - including the October Revolution in Jazz and the creation of the Jazz Composers Guild - in 1964, his organisation of the Contemporary Center, NYC in 1965, and his work as a record producer for Savoy.